THE STORY - In 1985, Russian boxer Ivan Drago killed former U.S. champion Apollo Creed in a tragic match that stunned the world. 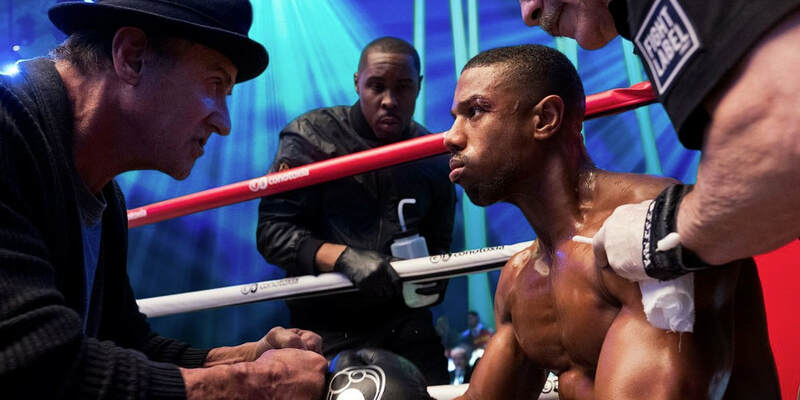 Against the wishes of trainer Rocky Balboa, Apollo's son and current champ Adonis Creed accepts a challenge from Drago's son -- another dangerous fighter. Under guidance from Rocky, Adonis trains for the showdown of his life -- a date with destiny that soon becomes his obsession. Now, Creed and Balboa must confront their shared legacy as the past comes back to haunt each man. THE GOOD - Michael B. Jordan, Tessa Thompson & Sylvester Stallone continue to be the beating heart of this franchise. The story follows a natural progression from the first and even "Rocky IV." Steven Caple, Jr. carries over the established tone and style of the first film. THE BAD - The screenplay, although it pays respect to the past and establishes a legacy for the future, can be a bit formulaic and on the nose. Caple does an admirable job but cannot match the level of creativity which Coogler brought to the first film. "Creed" landed in 2015 with a heavy right hook to the face of an unsuspecting film industry, solidifying director Ryan Coogler's place in Hollywood (He would go on to direct the cultural phenomenon "Black Panther" afterward). It also established Michael B. Jordan as a bonafide star, introduced us to Tessa Thompson and gave us the best performance of Sylvester Stallone's career. It was a rousing success that paid homage to the past while establishing a new legacy for the future. "Creed II" may not have writer/director Ryan Coogler at the helm anymore but sophomore director Steven Caple, Jr. smoothly steps in the director's chair while Sylvester Stallone picks up screenwriting duties (along with Juel Taylor) to ensure that "Creed II" continues to carry on both the "Rocky" and "Creed" storylines in the most organic way possible. Round 2 may have just begun but this fight will certainly continue due to the careful groundwork laid out by this franchise's impressive cast and crew. It's been 33 years since Ivan Drago (Dolph Lundgren) was defeated by Rocky Balboa (Sylvester Stallone) on Christmas Day in the Soviet Union, in an effort to avenge the death of Apollo Creed, the father of now World Heavyweight Champion Adonis Creed (Michael B. Jordan). Ashamed, broken and cast out by everyone in his life, Ivan has spent the last several years preparing his son Viktor Drago (Florian Munteanu) to fight and one day reclaim his honor. When the hulking Viktor issues a challenge to Adnois for the title, Adonis is overcome with rage and confidence, leaving him vulnerable to the much larger fighter for not just the title but also, like his father, potentially his life. Matters become more complicated when Adonis and Bianca (Tessa Thompson) decide to take their relationship to the next level and Rocky has his own personal conflicts regarding the fight. Much like the rebooted "Star Trek" franchise, "Creed" and now "Creed II" continues to thrive due to the talented nature of its cast. Michael B. Jordan, Tessa Thompson, and Sylvester Stallone all have a natural chemistry with one another. Due to the careful creation of the relationships each of these characters share with one another, there is an emotional bond that resonates both inside and outside of the ring. We watch as these characters grow, support one another, fail and pick themselves back up again. Although "Creed II" clings a little too heavily to the past (it's pretty much a direct sequel to "Rocky IV"), the commitment from each one of the actors (especially Jordan's physicality) raises the material past the nostalgia and the cliche to present a film which feels both like a natural continuation of the story and its own standalone film within the franchise. Steven Caple, Jr. carries over the same visual style as Ryan Coogler did with "Creed," but this time there is less creativity in the overall presentation outside of some decent sound mixing and slow-motion during the boxing matches. The film also features the typical training montage which we have come to expect from this franchise. What's old is new again though with the "Creed" franchise for at least this one takes place out in the desert which gives it a unique characteristic. Ludwig Göransson returns to score the film but the score starts to become derivative after a few tracks repeat themselves time and time again. Stallone's script, while not necessarily groundbreaking, much like the commentary during the fights, is on the nose but packed with emotion and passion. Some credit is owed though to the fact that both Ivan Drago and his son Viktor Drago are humanized with clear motivations for why they are fighting this time around so much so that as the commentary team says at one point, the story of fathers and their sons colliding in the ring once again feels "Shakespearean." We didn't necessarily need the movie to spell it out for us like that but I appreciate the effort. And that's how I feel about "Creed II" all around. it's a well-respected followup from a first entry that took everyone by surprise so much so that expectations were probably too high to meet this time around. However, everyone gives an admirable effort in ensuring that Adonis Creed doesn't just live in the shadow of Rocky Balboa but is instead regarded as much of a cinematic icon as the Italian Stallion. The story is personal, the stakes are higher, the environment is hostile, the journey has been hard but just like when Adonis enters the Moscow arena for the final climatic fight which will both establish his legacy and close a major chapter on his life, he has the backing of those closest to him to see himself through to victory. Now the question is, where does the story go from here? The franchise is certainly at risk for becoming a little too formulaic and could get gassed out after numerous rounds. But let's not throw in the towel just yet. Until then, "Creed II" is worthy of continuing to hold the title.